The Trump administration’s proposal to roll back fuel economy and greenhouse gas standards (“clean car standards”) omitted internal administration analysis showing that extra pollution resulting from the plan would cause up to 299 premature fatalities per year by 2050. The proposal also would result in Americans missing thousands of days of work annually from conditions such as acute bronchitis. The omission of this information from the proposed rule is particularly notable because the administration framed safety as the central rationale for proposing the rollback. The proposed rule, which was jointly released on Aug. 2 by the U.S. Environmental Protection Agency (EPA) and National Highway Traffic Safety Administration (NHTSA), purports to save about 1,000 lives annually. It is named the “Safer Affordable Fuel-Efficient (SAFE) Vehicles Rule.” It would freeze automobile fuel economy and greenhouse gas emission standards at 2020 levels, foregoing improvements that are slated to take place between 2021 and 2025. It is worth noting that the safety claims in the “SAFE” rule suffer from numerous flaws, as Public Citizen and the administration’s own EPA experts have observed. Half of the lives the proposed rule purports to save would result from people being deterred from driving because they would experience worse fuel economy than if existing standards were retained. Other safety claims relied on dubious assumptions about how much it would cost the automakers to comply with the existing standards and equally questionable extrapolations from those assumptions. EPA experts’ analysis concluded that the proposed rule would result in more fatalities per mile driven than the status quo. Accompanying the rulemaking, NHTSA produced a draft Environmental Impact Statement (draft EIS). The draft EIS acknowledged that negative health consequences would result from the proposals that the administration was contemplating. The proposed “alternatives would result in increased incidence of [particulate matter]-related adverse health impacts due to the emissions increases. Increases in adverse health outcomes include increased incidences of premature mortality, acute bronchitis, respiratory emergency room visits, and work-loss days,” the draft EIS said. 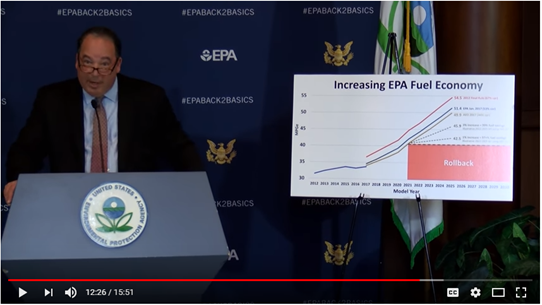 [Draft EIS, p. S-7 and S-8] The administration chose the most environmentally damaging of the alternative of those analyzed in the draft EIS as its preferred option in the proposed rule. Source: Draft EIS. The figures presented here referred to the alternative that the administration adopted as its preferred option in its proposed rule. It is important to note that these adverse effects would be in addition to the significant health impacts from the additional global warming pollution due to the Trump administration proposal, which would undo our most effective federal climate program on the books. This rule would have devastating consequences for the 25 million Americans who currently have asthma, as warmer temperatures exacerbate air quality issues. Hotter temperatures driven by climate change also increase the risk of unhealthy ozone levels and lead to increased drought and wildfires (both of which create particle pollution). Other impacts from climate change include severe weather events and the spread of infectious vector-borne disease. The transportation sector is the largest source of GHG emissions in the United States. Freezing clean car standards at 2020 levels would cause emissions of 2.2 billion metric tons of GHG emissions by 2040 that would otherwise have been avoided. Non-greenhouse gas pollutants are expressly regulated by the Clean Air Act Tier 3 standards. However the proposed rule would result in increased emissions of these pollutants. The proposed rule reports that determining the pollution consequences from the policy change would require analysis that had not yet been conducted at the time of publication but will be conducted prior to issuance of a final rule. The contents of that analysis and any other findings on health effects due to increased pollution that are included in the final rule will warrant very close examination and consideration. Finally, the Trump administration has come up with a way to relieve traffic congestion and improve public safety: It proposes to saddle us with cars that burn so much fuel that we will be deterred from driving, thus reducing traffic and saving lives. The administration last week issued a proposed rule that would halt progress on clean car standards by freezing targets at 2020 levels. Fortunately, the administration is required to justify the rollback because the law requires fuel economy standards to be set at the “maximum feasible” level. The case that the authors of the proposed rule put forth is truly bizarre, even by Trump administration standards. First, the authors promise to save consumers money. But to get there, they more than double estimates on how much it would cost the automakers to meet the standards currently on the books. The Obama administration said in 2016 that it would cost about $900 per vehicle to meet the 2025 mark. The Trump administration has conjured a price of $1,850 to $2,260 per vehicle. This pessimistic prediction directly contradicts recent experience. The automakers exceeded requirements for the first round of standards, which began in 2012, at or below the costs forecast by the Obama administration and there is nothing to suggest that they would not continue to do so. The authors rely on this highly suspect forecast to arrive at a conclusion that their rule would yield benefits because the savings from buying cheaper, dirtier cars would exceed the extra cost of driving them. It gets worse from there. The authors also promise $85 billion in “savings” in the form of intangible benefits due to reduced traffic congestion and noise. We would enjoy this peaceful respite, they say, because Americans would be deterred from driving due to the worse gas mileage the administration’s plan would leave us with. That tortuous logic provides about half of the basis for the rule’s marquee claim: that it will save 12,700 lives over a dozen years. The proposed rule devotes considerable space to promising that the less stringent fuel economy standards will save lives by enabling cars to be heavier. But this long discredited theory is mostly irrelevant to the administration’s ultimate case because the rule attributes only 1 percent of averted fatalities to heavier vehicles. The authors attribute about 49 percent of these lives saved to more people buying new, safer cars, because vehicles would be cheaper under their plan. This claim is fraught with many problems, not the least of which is the proposed rule’s reliance on a greatly exaggerated assumption of how much cars would cost if we stay the course. That leaves the truly precious part: How the rule would achieve the other 50 percent of averted fatalities. Employing the same logic as used to predict reduced traffic congestion, the authors promise that their plan will save 6,340 lives because it will make driving more expensive, causing us to drive less. If such a result is something to be proud of, the 4.1 percent economic growth figure that sent Trump and his boosters into orbit last week would have been cause for mourning. Faster economic growth is directly correlated with more miles driven. If reducing driving is a desirable outcome, the administration should be seeking to plunge us into a crippling recession at once. Milton Friedman, the deity of conservative economists, was once told that a team of roadway workers was given shovels instead of tractors in order to create more construction jobs. “Then why not give them spoons and create even more jobs?” Friedman reputedly asked. One can only wonder what he would have said if told the Trump administration wanted to make driving more expensive to save lives. Why not ban cars and give us hiking boots? As if the relentless heat wasn’t enough this summer, Austin is experiencing hazy skies due to an African dust cloud originating in the Saharan desert. The dust was most noticeable on Sunday, July 1. 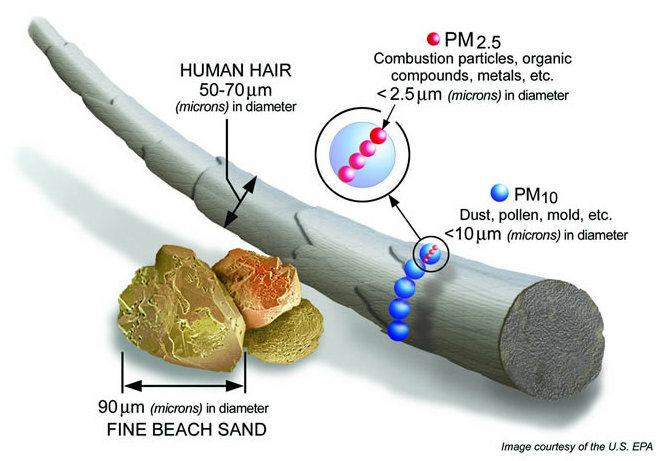 The technical term for this dust is “fine particulate matter,” particles that are so small they can travel from our lungs into our blood stream, causing health problems. An individual particle is 1/20th the width of a human hair. The Clean Air Act establishes standards for fine particulate matter (also known as “PM2.5” because it is 2.5 microns in diameter) in the air we breathe. PM2.5 is measured in micrograms per meter cubed, a measurement of how much material is found in a given volume of air. The Environmental Protection Agency has established limits of PM2.5 at 35 μg/m³ in a 24 hour period and 12 μg/m³ in an annual average. If an air monitor exceeds that level of PM2.5, then the region it monitors risks being designated in “nonattainment” of the federal standard. There are currently no areas in Texas in nonattainment of the PM2.5 standard, though there are several areas in nonattainment of the ozone pollution standard. Unfortunately, the Austin area got very close to violating the PM2.5 standard on Sunday. The table below lists hourly monitor values at the Zavala air monitor in Austin (you can see a map of all the air monitors in Texas here). As you can see, the 24-hour average of monitor values at Zavala on July 1 was 32.5 μg/m³, very close to the EPA’s standard of 35 μg/m³. This does not mean, though, that Austin risks falling out of attainment of the fine particulate matter standard. There are a few reasons for this. First, measuring compliance with the standard is a complex calculation that involves averaging three years of air monitoring data. Second–and more importantly for air quality this week–African dust is considered an “exceptional event” that would be excluded from the data anyway. An exceptional event is an air pollution event that is excluded from the data because it meets certain criteria. The EPA establishes the criteria for an air pollution event to be considered exceptional. These criteria include that “the event is associated with a measured concentration in excess of normal historical fluctuations, including background.” 40 CFR § 50.14(c)(3)(iv) (emphasis added). African dust has been reaching Texas since time immemorial, and the impact of these events on air quality in Texas is absolutely part of the normal historical fluctuations of weather and air quality. In fact, the phenomenon was first identified by a noted historical figure, Charles Darwin, during his famous trip aboard the H.M.S. Beagle in 1833. You might think that the considerable historical record on African dust events would cause EPA to reject their exclusion from the data on the basis that they are, after all, well within “normal historical fluctuations.” You would be wrong. The truth is that Texas has a long history of claiming exceptional events that include African dust storms. Other typical exceptional events in Texas include agricultural fires in Mexico (as old as agriculture) and ozone pollution blowing in from other countries (also Mexico, also old). Why does this matter? Most importantly, air pollution is linked to public health. 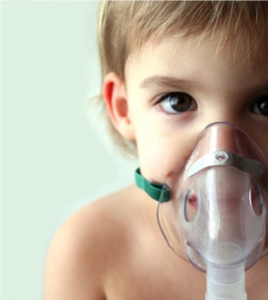 Children, the elderly, and people with respiratory ailments such as asthma and COPD are particularly vulnerable to air pollution. We have to keep our air clean to keep ourselves healthy. But nonattainment designations have consequences for a region that can last for decades and cost billions of dollars. Houston and Dallas, for example, have been trying to get into attainment of the ozone standard for decade. It’s why we have emissions tests for our cars, and why we can’t build a new factory without reducing pollution from an existing one. The consequences are so great precisely because the impact on human health is so serious. Asthma is the number one cause of school absences. Globally 7 million people die each year from air pollution. So the purpose of a nonattainment designation is to make our air healthier and protect ourselves and our children. Unfortunately, in Texas, the focus is on avoiding nonattainment designations and their consequences to big business. Several times in the last few years, Texas has used the exceptional events rule to keep areas artificially in attainment of air pollution standards. In 2013, the Texas Commission on Environmental Quality plainly stated that it was excluding enough exceptional events from Houston’s data to keep the area from being desingated under the fine particulate matter standard. Several air quality advocates (including myself) objected to this move. We even pointed to Charles Darwin’s observations as evidence that Texas could not exclude African dust events from its data. Our objections were ignored by Texas and EPA. The result today is that thousands of people are breathing air that does not meet federal pollution standards. Their health will suffer as a result. Some people will even die. There are quantifiable consequences to these decisions, and they are measured in human lives. Since the 2013 move to avoid designating Houston as not meeting the PM2.5 standard, several other exception event exclusions have kept areas of Texas artificially in attainment of pollution standards. El Paso doesn’t meet the ozone standard, but exceptional events blamed on Mexico in 2015 have helped the area to avoid a nonattainment designation. More recently, the failure to designate San Antonio as not meeting the ozone pollution standard was blamed on ozone transport from other regions. In some cases, Texas is using the law correctly to exclude exceptional events. (Houston’s lack of a PM2.5 designation is not one of these cases. We still maintain that it was done improperly and in violation of the exceptional events rule and the spirit of the Clean Air Act.) But even if the state is legally correct in its maneuvers, it’s doing so at the cost of human health. When the Texas Commission on Environmental Quality relies on tricks of data manipulation to avoid federal scrutiny, it is prioritizing business interests over people. A nonattainment designation has consequences for business and industry: old plants have to clean up, new plants have to invest in clean tech. These consequences do reach into the billions of dollars. The total cost of compliance with the Clean Air Act in 2020 is estimated to be $65 billion. But the health benefits of cleaner air in 2020 is estimated at $2 trillion. That’s a return on investment of more than 30 to 1. Notably, more and more of our air pollution is coming from vehicles. When you register your vehicle, you pay a fee that is used in part to reduce vehicle pollution. When you get your car inspected and make any improvements needed to meet emissions standards, you are investing in clean air. Texas makes sure that you pay your fair share of the cost of reducing air pollution, and you should be happy to do so. After all, it is an investment in your health and your children’s future. So why does Texas keeping fighting against Clean Air Act regulation? It’s a question of priorities. Much of the cost of compliance is born by industry, especially the oil and gas industry. That’s a powerful lobby in Texas, far more powerful than children who can’t go to school because of chronic asthma attacks. Texas is willing to skirt some regulations in order to save money for industry. It isn’t willing to invest in environmental improvements that pay huge dividends to its people in the long term. Industry profits today, or public health tomorrow. Texas has made its choice. What’s yours? Energy storage coming into its own all over the world, but there are some issues in Texas. Less than a month after Tesla Inc. unveiled a new backup power system in South Australia, the world’s largest lithium-ion battery has already been put to the test. Reports today say that it appears to be far exceeding expectations. In the first three weeks alone, the Hornsdale Power Reserve smoothed out at least two major energy outages, responding even more quickly than the coal-fired backups that were in place to provide emergency power. The area where the battery has been deployed in South Australia is in the grips of an energy crisis. In 2016, an outage left 1.7 million residents in the dark and storms and heat waves have caused additional outages. With the price of electricity soaring in Australia, this test of an industrial battery backup is being closely watched. In March, Elon Musk vowed on Twitter to deliver a battery system for South Australia’s struggling grid. By early July, the state had signed a deal with California-based Tesla and the French-based energy company Neoen to produce the battery, and by Dec. 1, South Australia announced it had switched on the Hornsdale battery. Fed by wind turbines at the nearby Hornsdale wind farm, the battery stores excess energy that is produced when the demand for electricity isn’t peaking. It can power up to 30,000 homes, though only for short periods — meaning that the battery must still be supported by traditional power plants in the event of a long outage. Nonetheless, the Hornsdale reserve has already shown that it can provide what’s known as a “contingency or ancillary” service — keeping the grid stable in a crisis and easing what otherwise would be a significant power failure. And, more important, the project is the biggest proof of concept yet that batteries such as Tesla’s can help mitigate one of renewable energy’s most persistent problems: how to use it when the sun isn’t shining or the wind isn’t blowing. In the UK, Pivot Power is not far behind, as they’ve just unveiled plans for an ambitious network of grid-connected energy storage and electric vehicle charging which could simultaneously balance supply and demand on the grid, and also provide electric vehicle rapid charging to hundreds of vehicles at once—without causing the kinds of surges in demand that naysayers were once so worried about. Specifically, once built, the proposed battery network would be the world’s largest of its kind—consisting of 45 sites (already identified) with 50MW of stationary battery storage at each location. Each spot would be co-located with electricity sub-stations in order to maximize grid-stabilization services, but also happen to be near major towns, cities or roads—potentially supporting up to 100 rapid 150KW chargers, and even 350KW chargers once cars are around that can charge that fast. Pivot Power is pretty explicit about their intention—and that’s to “accelerate the decline of petrol and diesel”. If nothing else, it’s refreshing to hear clean technology advocates talking in such ambitious, absolute terms. Because there’s no doubt that this is what needs to happen in order to achieve a low carbon transition. There is increasing high-level interest in the potential for energy storage in the Middle East, with grid-connected systems forecast to reach 1.8GW in the region by 2025. The region is at present a small market as far as energy storage and especially utility-scale advance battery energy storage is concerned. In fact, the majority of the Middle East’s installed base comes from just one project, a 108MW sodium-sulfur battery energy storage project for Abu Dhabi Electricity and Water Authority supplied by Japanese company NGK. 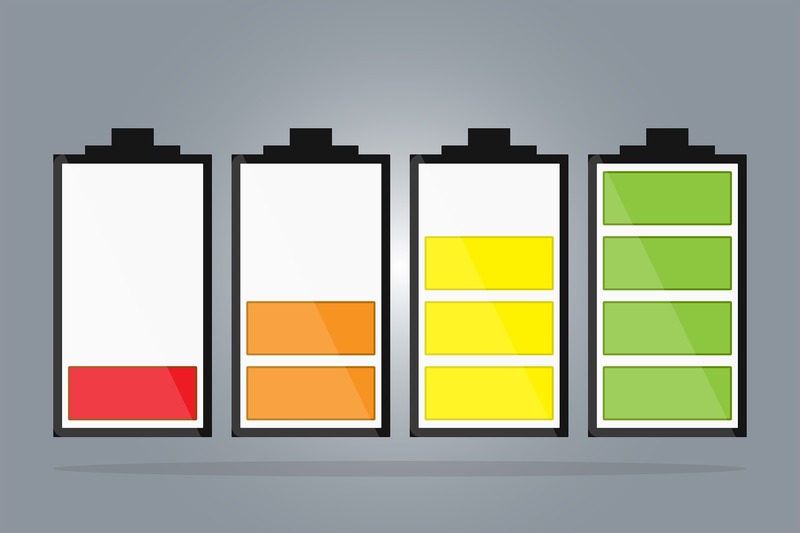 While energy storage is in its infancy in the region, it is unlikely to remain so long term. According to the World Economic Forum, energy storage in the form of large arrays of batteries is still in the early stages of deployment in Latin America. However, the role of electricity storage promises to become much more significant as the region diversifies its sources of power generation, and looks to batteries to help smooth out intermittent energy generation and mitigate the costs of peak demand. Namibia, a nation that’s considerably bigger than Texas but with only around 2.5 million people, installed almost 55 megawatts of generation from renewables and has projects under construction for another 121 megawatts, according to NamPower, the state-owned utility. However, the total installed capacity combined with committed renewable generation is reaching a threshold, at least until their grid can catch up. This illustrates how intermittent power generation penetration hits limits in these nations before bigger investments are required in the power distribution network. Technically, Nambia can handle about 275 megawatts of renewables, which is about half of the midday load according to a 2017 study. The country relies on imports for about 60 percent of its electricity, mainly from South Africa’s state-owned Eskom Holdings SOC Ltd., and even the import of baseload power does not guarantee grid reliability as some areas have daily power outages as a norm. Africa presents huge opportunities for developers of renewable-energy plants, since wind and solar are quicker and sometimes cheaper to build than coal and natural gas plants. While renewable sources such as wind and solar can leapfrog traditional generation, they do not provide consistent 24-hour baseload electricity. Namibia’s biggest domestic source of power is the Ruacana hydropower plant near the border with Angola. However, it has its own intermittency limit as it depends on the seasonal run of the Kunene River. Reaching a bottleneck hasn’t deterred Namibia from adopting more renewables in the future as it aims to reduce power imports. The National Integrated Resource Plan includes an allocation for biomass power plants with capacity of as much as 200 megawatts. Concentrated solar power is also called for in the plan. That technology concentrates the sun’s energy on heating a liquid that drives power turbines. Because the liquid can retain heat for a time after the sun goes down, those systems also can be used to store energy and deliver power to the grid at predictable times. If African nations begin to adopt storage into their power distribution network, it could go a long way to stabilizing their grids and potentially their countries. Stories like these are happening all over the globe. Right here at home, the Department of Energy recently awarded $20 million in funding for nine projects to advance early-stage solar power electronics technologies. The projects chosen were deemed critical to addressing solar photovoltaic reliability challenges, lowering the cost of installing and maintaining a photovoltaic solar energy system and achieving the DOE’s goal of cutting in half the cost of electricity for a solar system by 2030. Three million was awarded to engineering researchers at The University of Texas at Austin to overcome the same dilemma of overcoming the issues of intermittency with renewables. Experts from UT’s Cockrell School of Engineering have developed a way to integrate solar power generation and storage into one single system, effectively reducing the cost by 50 percent. The UT project will develop the next generation of utility-scale photovoltaic inverters, also referred to as modular, multifunction, multiport and medium-voltage utility-scale silicon carbide solar inverters. Utility-scale energy storage holds great promise both for energy conservation and grid reliability. But the quickly advancing technology also raises tough regulatory challenges, especially for complex power markets like that existing in Texas. Look for a future guest blog post from Public Citizen’s retired director, Tom “Smitty” Smith on the history of deregulation in Texas and what the impacts of that policy change are having on this new technology. Facing backlash to EPA Administrator Scott Pruitt’s toxic agenda and unethical behavior, it’s no wonder automakers are rushing to distance themselves from Pruitt’s rollback of the popular clean car standards. But as major automakers like Ford scramble to hide behind green-tinged statements, now is the time to watch what they do — not what they say. Shortly before the U.S. Environmental Protection Agency (EPA) announced its decision to roll back America’s clean car standards, Ford Motor Company issued a stunning statement: The company didn’t support a rollback, it claimed. Reporters gave the announcement wide coverage. But if you read between the lines, you can see that Ford is not breaking with other automakers; the company is just using carefully parsed wording to distract from what it is doing and leave a misleading impression. Below we help decipher what Ford’s executives said in their statement, offer background on Ford and the Alliance of Automobile Manufacturers’ backward push on clean car standards and provide indicators that consumers can use to determine whether Ford truly supports the standards or is just giving them lip service. Below are three of the most misleading parts in Ford’s statement, along with what the excerpts really mean and a fact check. Translation: For Ford, a win means having wiggle room in the standards, which means automakers would not have to meet them as written. Fact check: Clean car standards already are a win for consumers and the environment. According to the EPA’s 2017 Final Determination, Model Year (MY) 2022–2025 standards will cut 540 million metric tons of greenhouse gas emissions over the vehicle lifetimes and yield net benefits at the gas pump of nearly $100 billion. Standards force technology improvements, which lead to cleaner, more fuel-efficient vehicles. Without the standards, consumers lose and automakers can dump dirtier vehicles on the public. Ford asked for this “conversation” by lobbying the EPA to reopen the midterm review. Translation: We want one set of different (weaker) national standards. Fact Check: There already is one set of national standards, which were agreed upon by the Obama administration, the automakers and California. In 2017, the EPA reaffirmed those targets in tandem with California and 12 other states, which adopted them through 2025. In attempting to alter the agreement, the automakers are reneging on their commitment to the national program. Automakers also may refer to this as harmonization. This “flexibility” would increase carbon pollution and cost consumers more at the pump. Translation: Additional flexibility means different standards, which means lower standards. Fact Check: Some of the “flexibilities” that automakers have requested include: 1) calculating off-cycle credits retroactively; and 2) being able to increase credit swapping between cars and trucks. The first would allow automakers to bank credits for compliance from vehicles they have sold (rather than making continued fuel economy improvements). The second would allow automakers to raise the cap on credit trading between cars and trucks (so rather than ensuring fuel economy rises for both cars and trucks, this swapping would allow automakers stall/slow fuel economy for certain vehicles due to extra credit from others). According to a Union of Concerned Scientists analysis of legislation (S. 1273 and H.R. 4011) that includes the loopholes described above as well as increases to the lifetime of Corporate Average Fuel Economy (CAFE) credits, these loopholes would lead to about “350 million barrels of additional oil being burned, 155 million metric tons of additional global warming emissions and $34 billion in additional fuel costs. The impact of this flexibility is significant in terms of pollution and fuel economy, and would not lead to customer affordability. “Flexibility” and rollbacks are the same thing. When automakers say they want changes in clean car standards because they want “more affordable options for [their] customers,” be dubious. According to Consumers Union, because most buyers take out a loan to purchase a new vehicle, the cost of new technology is spread out over the length of the loan. Meanwhile they begin reaping net benefits from gas savings in the first month of ownership and onward. Auto execs meet with President Trump in the White House. Despite what Ford says, we have evidence that it is working to undo the standards behind the scenes. How? Ford has exaggerated the cost of compliance with the law in interviews and has met with President Donald Trump and the EPA to request delays, weakened targets and threaten the ability of California and other states to set their own pollution standards. On January 24, 2017, Ford’s then-CEO Mark Fields pushed for flexibility in meeting the standards during a meeting between Trump and other Detroit automakers at the White House. Fields claimed that complying with the clean car standards would risk 1 million U.S. jobs, a cherry-picked figure from a dubious report. Then, on a January 27, 2017, earnings call, Fields said that the company’s talk “resonated” with Trump. Ford was rewarded. On March 15, 2017, Fields, along with the CEOs of GM and Fiat-Chrysler, hosted Trump at an event in Michigan that provided a platform for the administration’s announcement that it would reopen the review of the clean car standards. 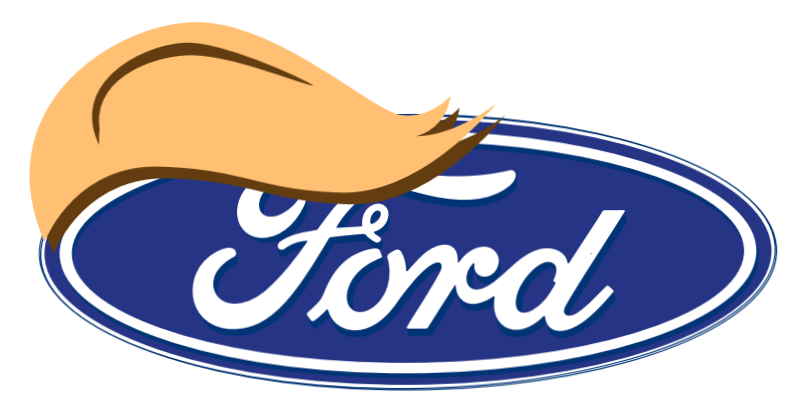 Ford is a member of the Alliance of Automobile Manufacturers (Auto Alliance), which, according to InfluenceMap, has “lobbied extensively to significantly weaken U.S. vehicle fuel economy standards.” If Ford truly believed the standards shouldn’t be rolled back, it wouldn’t be part of this group and would publicly distance itself from the group. Ford has done neither. According to a report from InfluenceMap, the auto industry spent $49 million lobbying in 2017, the highest amount since 2008. Nov. 10, 2016: the Auto Alliance asks President-elect Trump to reopen and “adjust” the settled clean car standards. Feb. 21, 2017: the Auto Alliance asks Pruitt to revoke the final determination for clean car standards. March 13, 2017: the Auto Alliance follows up the February request with a legal petition. (Two days later, the EPA complies). Sep. 6, 2017: In a public hearing on the EPA’s redetermination of the clean car standards, the Auto Alliance thanks the EPA for re-opening the midterm review and presses for modifications to the program. Feb. 7, 2018: the Auto Alliance submits a chart of studies to NHTSA for consideration in rulemaking. The list includes dubious “scientific” data, which questions climate science and the link between tailpipe pollution. It was prepared by organizations and people with close industry associations and climate skeptics, and cites a study by Anthony Cox Jr. that was funded by the American Petroleum Institute. The Auto Alliance’s president, Mitch Bainwol, was a speaker at Pruitt’s announcement of the redetermination of the clean car standards. In his remarks, Bainwol included a jumbo graph (below) with his definition of rollback, asserting that adjustments to miles-per-gallon (mpg) targets below those required by the current clean car standards aren’t a rollback; only adjustments that would make mpg less than today’s average mpg should be considered a rollback. To be clear: anything that lowers the goal from the original deal is a rollback. The Auto Alliance’s President Mitch Bainwol describes rollbacks. 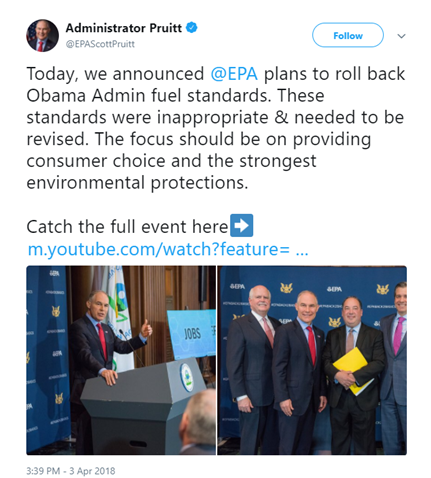 Just after the event, Pruitt tweeted pictures from the announcement, including a group photo with him and Bainwol with the text, “Today, we announced @EPA plans to roll back Obama Admin fuel standards.” Someone should let the Auto Alliance know that Pruitt agrees with consumer advocates that the EPA’s decision is indeed a rollback. Pruitt describes the EPA’s plans to roll back clean car standards. While Ford and the Auto Alliance argue semantics all they want, consumers want improved fuel economy, not fewer protections. Weakening the clean car standards means consumers pay more money at the pump for cars that spew more dangerous pollution into our air and turns back the clock on important progress. Given the grave consequences, consumers are watching these actions closely.